Sohn Ye-jin is set to play a skilled member of a crisis negotiation team, whose superior is taken hostage by Hyun Bin. She will lead the negotiations with the criminal to make sure her superior makes it out alive. Filming finished December 9, 2017. Hyun-Bin plays a villain for the first time in his acting career. Do not post successively except for liveblogging on drama's airtime. 01.Due to the copyright/legal problems, no illegal streaming links will/should be posted on this thread as there had been major crackdowns going on lately.02.Any complaints about any streaming links will be counted as spam and will be reported to the mods.03.Any complaints of the respective companies such as Viki, You Tube, Etc. should be report to the respective companies instead of posting your complaints here.04.Those who are caught breaking the Soompi posting rules more than 5 times will have their Id/IDs reported the mods. 05.Those who are caught promoting/posting illegal streaming links with subs ( those without permission from the orginal subbers and doesn't have copyrights like Viki, Dramafever) will have their ID's reported to the mods for endangering Soompi to legal issues for illegal streaming sites promotions. Ahh been awhile since we see Hyun Bin on silver or small screen..... looking forward to what's in store in 2018 with this film. Whoa! Hyun Bin 2 movies already for 2018? Outbreak and this? Be looking forward to this as well. The same thing I said in the Outbreak thread... 2 movies! but where is his drama.... I want drama too! Hyun-Bin & Son Ye-Jin are cast in new movie “Negotiation” (literal title). The movie will have Hyun-Bin playing a villain for the first time in his career. In the movie, Son Ye-Jin will play crisis negotiator Ha Chae-Yoon. She faces off against Min Tae-Koo (Hyun-Bin) who is holding his boss as a hostage. It has been confirmed that top actors Hyun Bin and Son Ye Jin have accepted their casting offers for upcoming film “Negotiation” (literal title). “Negotiation” will be a crime thriller about a crisis negotiation team’s best negotiator Ha Chae Yoon (played by Son Ye Jin) who tries to save her boss held hostage by a captor named Min Tae Kyu (played by Hyun Bin). This will be Hyun Bin’s very first time taking on a villain role. Filming is scheduled to begin in July. I am so excited about this movie! It's funny how Son Yejin cameo-ed in Secret Garden 7 years ago but both of them have never met onset until this movie. This pairing sounds good and I can't wait!!! Filming for movie “Negotiation” (literal title), starring Hyun-Bin and Son Ye-Jin, began June 17, 2017 in Paju, Gyeonggi Province, South Korea. The first scene filmed involved negotiator Chae-Yoon (Son Ye-Jin) facing off against Tae-Koo (Hyun-Bin) for the first time. Tae-Koo has taken his boss hostage. This is the first time that Hyun-Bin will play a villain in his acting career. “Negotiation” will be released sometime next year in South Korea. "Negotiation" Son Ye-jin vs Hyeon Bin, Who Will Win? This new criminal thriller movie is about a brilliant negotiator of Seoul Metropolitan Police Agency whose superior have been kidnapped by a kidnapper. Actor Hyeon Bin and actress Son Ye-jin have been selected as the main casts and just started shooting this month. Actress Son Ye-jin took the role of the negotiator Ha Chae-yoon, who is in the part of Police Station's Crisis Negotiation team who's responsible of making a huge decision each moment to protect the hostage. Last year, her acting in the movie, "The Truth Beneath" has received high praises as she acted a mother character that lost her daughter. For Actor Hyeon Bin, this is his very first villain role and we are anticipating a great change in his image. As the kidnapper, he will be playing the ruthless, cold-hearted criminal. As the negotiator and the kidnapper, Son Ye-jin and Hyeon Bin's brain battle will be an intense factor of this movie. A character with the job "Negotiator" is also a refreshing, new term in the Korean movie industry. The movie "Negotiation" will be produced by JK Film's director JK Youn, who has created the movies "Ode to My Father" and "Confidential Assignment". 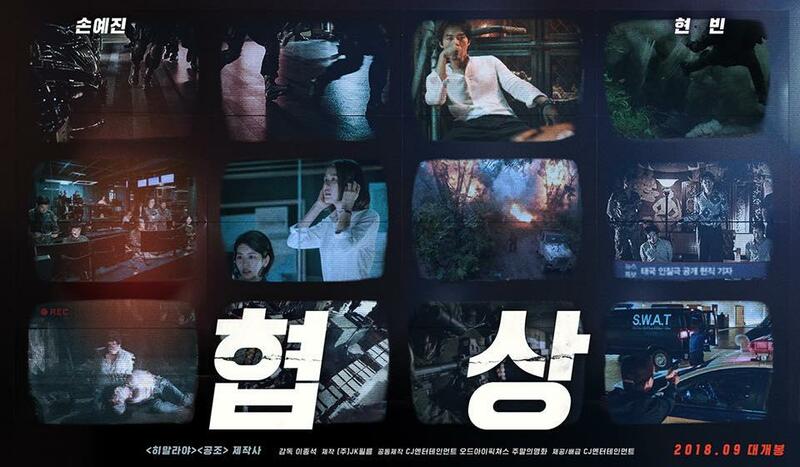 The connection between JK Youn and Hyeon Binbegan with the movie, "Confidential Assignment", and the work synergy between them lead to this movie. The Space (Hyun Bin Official Fan Club) Support on June 29, 2017. Coffee truck for Hyun Bin filming Negotiation. Teaser poster and release date added for upcoming movie “Negotiation” (literal title) starring Son Ye-Jin and Hyun-Bin. 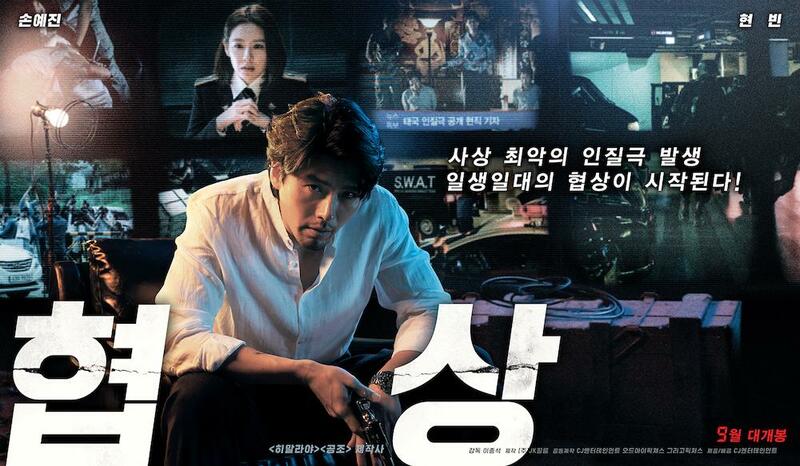 The film features Son Ye-Jin playing a negotiator for crisis situations and Hyun-Bin playing weapons smuggler. The negotiator has only 12 hours to save the lives of hostages held by the weapons smuggler. Release date for “Negotiation” is set for September, 2018 in South Korea.